It is important to note that science, unlike scientism, should not be a threat to religious belief. Science, to be sure, advocates a “naturalistic” rather than a “supernaturalistic” focus, and an empirical verification method for determining truths about the physical world and the universe. Yet the proper mandate of science is restricted to the investigation of the natural (physical, empirical) dimension of reality. It is this restriction that scientism has violated, replacing proper science with an illicit ideology that not only seeks to explain all things naturalistically, but assumes – without proof – that the spiritual realm is irrelevant, indeed non-existent. This unproven assumption is based on the mistaken belief that nothing exists unless it can be verified by the empirical scientific method. Such a belief is an invalid reductionism that reduces the explanation for all reality to physicality. This “physicalism” overextends the method and capabilities of science (Ashton & Westacott 2005:16). There are obviously disciplines in our world that cannot be tested empirically. I’m thinking especially of that which has happened in history. It cannot be examined according to the empirical system of current experimentation and repeatability. It also can apply to the disciplines of sociology and cultural anthropology. (3) ‘The proposed explanatory story must prove itself fruitful in other related areas’. (a) ‘The stack of data to be included is vast and bewildering’. (b) ‘The construction of an essentially simple historical hypothesis is … a major problem’. (c) ‘The wider jigsaw of the first century as a whole’. He takes New Testament scholars to task who evolve ‘highly sophisticated ways of getting off the horns of the dilemma posed’ by criteria (a) and (b). What some of these scholars do in dealing with ‘recalcitrant data’ is ‘to show that it comes, not from Jesus himself, but from the later church. The data thus disappear from the picture of Jesus, but at a cost’ (Wright 1992:100-101). This entry was posted in History, Science on 22 March 2015 by spencer. Did God create the world in 6 literal days? This sounds like a dumb question but if in God’s time 1 day is 1,000 years, does that mean that He created the world in 6 days or 6,000 years? I know that God created the world in 6 days and rested on the seventh, but I was wondering that. If he literally created the world in six days then where does the 1 day = 1,000 years come from? A. Is a day compatible with a thousand years? “But do not forget this one thing, dear friends: With the Lord a day is like a thousand years, and a thousand years are like a day” (NIV). This has to do with God, the eternal One, and time. I urge you to read D Martyn Lloyd-Jones sermon on 2 Peter 3:8-9, ‘God and time‘. B. Days, long periods of time or figurative language? No where in Genesis does it say God created the sun, you are reading into it and changing the sentence by trying to understand it on your terms and not Gods [sic]. God created light, you just assume he speaks of the sun. The first day is when light was created on the fourth day the stars were aligned into the zodiac we know today to give us signs to go by. You my friend are not rightly dividing the word of God, with that said look at the verses I cited earlier in a KJV bible and explain them please if what I have been shown is wrong. I think you are trying to split hairs. Genesis 1:1 is VERY COMPREHENSIVE as to what God created, ‘In the beginning God created the heavens and the earth’. Are you saying that this does not include God’s creating the sun? I find that to be straining at a gnat! 8 “Remember the Sabbath day, to keep it holy. 9 Six days you shall labour, and do all your work, 10 but the seventh day is a Sabbath to the Lord your God. On it you shall not do any work, you, or your son, or your daughter, your male servant, or your female servant, or your livestock, or the sojourner who is within your gates. 11 For in six days the Lord made heaven and earth, the sea, and all that is in them, and rested on the seventh day. Therefore the Lord blessed the Sabbath day and made it holy (ESV). 8 “Remember the Sabbath [long period of time or figurative day], to keep it holy. 9 Six [long periods of time or figurative days] you shall labour, and do all your work, 10 but the seventh [long period of time or figurative day] is a Sabbath to the Lord your God. On it you shall not do any work, you, or your son, or your daughter, your male servant, or your female servant, or your livestock, or the sojourner who is within your gates. 11 For in six [long periods of time or figurative days] the Lord made heaven and earth, the sea, and all that is in them, and rested on the seventh [long period of time or figurative day]. Therefore the Lord blessed the Sabbath [long period of time or figurative day] and made it holy. The comparison with the work week of 6 literal days and 1 literal day of rest, with the 6 days of creation and 1 day of rest by God makes the parallel very obvious. God is speaking of 6 literal days of creation and 1 literal day of rest. I have a hunch that if it were not for the theory of evolution, the 6 literal days of creation would not be creating issues for us. What was Darwin’s aim when he proposed the theory of evolution? I invite you to read, ‘Darwin’s arguments against God‘. Darwin wanted God out of the picture with the creation of the world. I invite you to consider how worldly science – in many areas – wants God eliminated from the creation events so that He can be replaced with a human ‘origin of the species’. I have a high regard for empirical science that depends on repeatability to experiment with various products. My mechanical heart valves depend on daily doses of the drug warfarin and vitamin K when needed to reverse warfarin’s excessive impact on the blood. C. The nature of ‘days’ doesn’t really matter? Another view was, ‘I don’t think it’s a dumb question but does the answer really matter? None of us will know for sure till Abba answers us HimSelf or gives divine revelation’. Does it really matter? For consistency of interpretation it does matter. Does it matter that ‘day’ as a long period of time or a figurative day conflicts with Exodus 20:8-11? Yes it does! I want to be a consistent biblical interpreter when comparing Genesis 1 with Exodus 20, for example. Alister McGrath has an interesting assessment in ‘Augustine’s Origin of Species‘. D. What about ‘day’ in Genesis 2:4? The days in Genesis 1 are literal days, 24 hr or less. Both the Exodus passage agrees that God made everything in 6, 24 hr days. There is a problem though, and I think it’s in Gen 2:4 “in the day” the Lord made heavens and earth. Is this still 24 hour? Because here the author does not say what day it was. This is like saying “back in my youthful day” etc. What do you guys think? This question has been asked many times over by questioning people as the use of ‘day’ in Gen 2:4 seems to have a different meaning to ‘day’ in Genesis 1. My response was that evangelical commentator on Genesis, H C Leupold (1942), divides Gen 2:4 into two verses and joins the second part with v. 5. His translation of Gen 2:4a is, ‘This is the story of the heavens and the earth at the time of their creation’. He explains that his translation, ‘at the time of their creation’ is rendered literally: ‘in their being created’. He further wrote that ‘since it is a temporal phrase, we have rendered it: “at the time,” etc. It marks the occurrences that are to follow as practically a part of the creation story’ (Leupold 1942:111). Then, Gen 2:4b, 5 he translates as, ‘At the time when Yahweh God made earth and heaven, then no shrub of the field was as yet in the earth and no plant of the field was as yet sprouting forth; for Yahweh God had not caused rain to descend upon the earth, nor did man exist to till the ground’. ‘as a whole, with the result that two temporal clauses of nearly identical meaning appear within the sentence, calling forth artificial attempts at distinctions. By keeping 4a separate as a title and by combining 4b with 5, this trouble is removed, and a very natural rendering results. For the two initial clauses of v. 5, introduced by waw, may be correlative…: ‘when God made heaven and earth neither was there shrub … nor had any plant sprouted’. At the same time the complicated sentence structure which the critics make of v. 5-7 is shown to be quite unnecessary and quite cumbersome: v. 5 protasis; v. 6 rather parenthetical, or a concessive clause; v 7 apodosis – all of which calls for a very artificial rendering…. Nor is terem the conjunction ‘before,’ but the adverb ‘not yet’ (Leupold 1942:112, emphasis in original). He explains that Gen 2:4b ‘takes us back into the time of the work of creation, more particularly to the time before the work of the third day began, and draws our attention to certain details, which, being details, could hardly have been inserted in chapter one: the fact that certain forms of plant life, namely the kinds that require the attentive care of man in greater measure, had not sprung up. Apparently, the whole work of the third day is in the mind of the writer’ (Leupold 1942:112). The specific question asked by this person related to the meaning of ‘in the day that the Lord God made the earth and the heavens’ (Gen 2:4 ESV). it is not important to the author to mark the point of time within the creation week when this condition prevailed. Consequently, the opening phrase of 4b, beyom, is to be rendered as it so often is “at the time” and not “in the day” (1942:113). I found this explanation helpful as it gives the meaning of the ESV’s translation of ‘in the day’ to be ‘at the time’. This clears up the confusion for me. For some penetrating, thought-provoking articles on creationist topics, I have found Creation Ministries International (CMI) to have some targeted answers to questions about origins. And some of them are by Christians who are scientists. I am somewhat guarded in recommending this CMI website because of its short-sighted view that one has to be a Young Earth Creationist (YEC) to be regarded as having a high view of creation. This is not the case. There are unprovable presuppositions in most, if not all, the scientific arguments for an old earth…; that is, an earth that is millions or billions of years is biblically possible but not absolutely provable…. Given the basics of modern physics, it seems plausible that the universe is billions of years old. And as shown [in what he presented] there is nothing in Scripture that contradicts this…. There is no demonstrated conflict between Genesis 1-2 and scientific fact…. A literal interpretation of Genesis is consistent with a universe that is billions of years old (Geisler 2003:648, 650). Did God create plants on Day 3 out of nothing? That should get you started on some Christian answers to the origin of the world. Geisler lists these orthodox Christians who held to a universe of millions or more years old. These included: Augustine, B B Warfield, C I Scofield, John Walvoord, Francis Schaeffer, Gleason Archer, Hugh Ross, and most of the leaders who produced the 1978 Chicago Statement on the inerrancy of the Bible (Geisler 2003:650). Leupold, H C 1942. Exposition of Genesis, vol 1, chapters 1-19. London: Evangelical Press (originally by The Wartburg Press). Lik3#1, Christian Forums, Apologetics, ‘Did God literally create the world in 6 days?’ http://www.christianforums.com/t7775833/ (Accessed 26 September 2013). This was my brief response at OzSpen#14, ibid. Copyright © 2013 Spencer D. Gear. This document last updated at Date: 22 September 2018. This entry was posted in Creation, Evolution vs Creationism, Genesis on 26 September 2013 by spencer. Has the evidence for climate change been concealed, censored or ignored? I was shocked, surprised and encouraged to read this article in one of the main-stream media outlets in Australia, The Australian newspaper (3 July 2013) – one of our leading daily publications. It provides evidence about the smokescreen of climate change. Why don’t you take a read of Michael Newman’s evidence, ‘Climate change science has become an expensive smokescreen‘? 1. A mass of dense artificial smoke used to conceal military areas or operations from an enemy. 2. An action or statement used to conceal actual plans or intentions (‘smoke screen’, The Free Dictionary). The voices of alarm and authority have been unable to hide the reality that, statistically, there has been no increase in global temperatures since 1997, despite an 8.3 percent rise in atmospheric CO2. For those who want to cite warming in some records, all datasets agree there has been none since 2000. In fact since 2002 a slight cooling has been observed. Who knew? Well, not the warmist scientists. Indeed, the ABC reported: “A study forecasts that global warming will set in with a vengeance after 2009, with at least half of the following five years expected to be hotter than 1998, which was the warmest year on record.” Wrong. Even recent claims of an “angry” Australian summer were not validated by satellite data. Scientists have long searched for a “hot spot” in the atmosphere. When it could not be found, some said it must be in the oceans. Yet, since the deployment in 2003 of 3000 Argo floats (the acme of ocean temperature measurement), researchers still haven’t found it. While CO2 may be a greenhouse gas, it seems that natural forces dominate climate change, not mankind’s emissions. Henrik Svensmark’s theory of cosmoclimatology (the role of cosmic rays) may be right. The study into household attitudes towards the environment shows Australians are more sceptical than any of the other 10 nations examined, with the exception of The Netherlands. It shows 45 per cent of Australians think environmental dangers are exaggerated and are reluctant to pay for government environmental policies. In contrast, 42 per cent of Australians believe the environmental challenges are real and think the government should take action, which they are prepared to pay for even if the amount is not matched by other nations. The OECD study identifies a third group of people who believe that environmental dangers are real, but thinks technological progress will resolve them. This group is about 10 per cent of the Australian population. In Canada, Sweden and France, more than half the population is motivated by environmental concerns, while less than 40 per cent are sceptical (emphasis in original). But there are those who challenge the climate change denial and examine the social science behind denial. One example is Haydn Washington and John Cook 2011. Climate change denial. London/New York: Earthscan (Routledge). Humans have always used denial. When we are afraid, guilty, confused, or when something interferes with our self-image, we tend to deny it. Yet denial is a delusion. When it impacts on the health of oneself, or society, or the world it becomes a pathology. Climate change denial is such a case. Paradoxically, as the climate science has become more certain, denial about the issue has increased. The paradox lies in the denial. There is a denial industry funded by the fossil fuel companies that literally denies the science, and seeks to confuse the public. There is denial within governments, where spin-doctors use ‘weasel words’ to pretend they are taking action. However there is also denial within most of us, the citizenry. We let denial prosper and we resist the science. Climate Change Denial explains the social science behind denial. 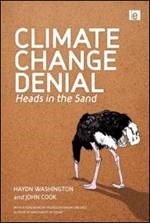 It contains a detailed examination of the principal climate change denial arguments, from attacks on the integrity of scientists, to impossible expectations of proof and certainty to the cherry picking of data. Climate change can be solved – but only when we cease to deny that it exists. This book shows how we can break through denial, accept reality, and thus solve the climate crisis. It will engage scientists, university students, climate change activists as well as the general public seeking to roll back denial and act. See also ‘Global Warming & Climate Change Myths’ from Skeptical Science. So, Maurice Newman’s timely article in The Australian raises some issues of concern for all of us regarding the evidence against artificially created climate change that may have been presented to the public as a smoke screen. This entry was posted in Climate Change on 9 July 2013 by spencer. Earth rotating around the sun and gravity are given as examples that ‘evolution is true because of all the factual supporting evidence’ by Phil Gilbank (Pine Rivers Press, February 6, 2013). Phillip E. Johnson, Professor of Law at the University of California at Berkeley for 20 years used his skills as a lawyer to investigate the evidence as the books defending the Darwinian theory ‘were dogmatic and unconvincing’. What did he conclude after gathering the evidence? ‘Darwinist scientists believe that the cosmos is a closed system of material causes and effects, and they believe that science must be able to provide a naturalistic explanation for the wonders of biology that appear to have been designed for a purpose’. He continued: ‘Without assuming these beliefs they could not deduce that common ancestors once existed for all the major groups of the biological world’. And there’s another belief they have: ‘Random mutations and natural selection can substitute for an intelligent designer’. But have a guess what? ‘Neither of these foundational beliefs is empirically testable [by science] and … neither belongs in the science classroom’. But Mr Gilbank wants us to believe that evolution is supported by lots of factual evidence. Not according to a leading lawyer who examined the evidence! This is a letter-to-the editor that I sent to Pine Rivers Press on 5 May 2013 that was not published. The email address is: letters@northlakestimes.com.au. Phillip E. Johnson 1991. Darwin on Trial. Downers Grove, IL: InterVarsity Press, p. 144. This entry was posted in Evolution vs Creationism, Worldview on 20 May 2013 by spencer. I believe in what has been called the “day-age” interpretation of Genesis one – that is, that each “day” is actually a long period of time during which God created life. This interpretation is not figurative in any way, but adheres to the scientific method in its analysis of the biblical texts. At its foundation is a literal translation of the Hebrew word, yom, which can mean a twelve hour period of time, a twenty-four hour period of time, or a long, indefinite period of time. The biblical basis for the translation of the word yom as long periods of time appear on another page. That when one properly reads Genesis 1, going back to the original language, one find(s) no contradiction with the findings of modern science. In fact, one finds confirmation of the Biblical record in modern scientific findings! Consistency between the Bible and science is what we should expect. For if the Creator of the heavens and the earth also inspired the writers who penned the words of the Bible, why shouldn’t we expect the discoveries of science to support the Bible? It would be surprising if they did not. The ancient Hebrews hardly could have imagined that the creation week was any different from theirs. Thus when the Ten Commandments were issued, requiring them to observe a day of rest, it was natural for the creation week to serve as their model (Exodus 20:11). It is doubtful that any of the Jews who heard this command raised a hand to inquire about the duration of either their week or God’s. Regardless of what the astronomers and cosmologists may say about the age of the Universe, Genesis describes a creation week comprised of ordinary days. Contemporary efforts to reinterpret these days succeed neither to enhance confidence in the truthfulness of Scripture nor to accommodate current age calculations. For a similar view that supports literal 24-hours for the days of Genesis 1, see ‘How long were the days of Genesis 1?’ from Creation Ministries International. If the phrase, ‘the heavens and the earth’, refers to the universe or the cosmos (which seems to be the most likely understanding), then it is taken in the same sense as throughout the Bible as in passages like Joel 3:15-16. Thus, the creation of the universe would include the sun, moon and stars according to Gen. 1:1. According to the Bible, on what day was the sun created?…. I’ve read conflicting opinions. Most of which say the 4th day but that begs the question “How can you have 3 days without a sun?”…. Sailhamer’s exegesis and exposition stated that the place to begin with an understanding of the fourth day of creation (Genesis 1:14-18) is to view the whole of the universe (including the sun, moon and stars) to have been created ‘in the beginning’ (Gen. 1:1) and NOT on the fourth day. If we try to understand the syntax of Gen. 1:14 and it is compared with the creation of the expanse in 1:6, the verses have two different senses. The syntax of 1:6 suggests that God said, ‘Let there be an expanse’. God was creating an expanse where there had not been any previously. So the author of Genesis clearly wanted to state that God created the expanse on the first day. And God said, “Let there be lights in the vault of the sky to separate the day from the night, and let them serve as signs to mark sacred times, and days and years (NIV). What is the grammatical difference? The syntax of Genesis 1:6 uses hayah alone, while in Genesis 1:14, it is hayah + l infinitive (Sailmaher 1990:34). The exegetical response, with God’s revelation (Scripture being the decider), is that if we are to understand the grammar of Gen 1:14 correctly, the author does not state that this was the creation of the lights, but the narrative assumes that the heavenly lights were already created. What is the assumption? The lights were created ‘In the beginning’ as stated in Genesis 1:1. I’m indebted to John Sailhamer for this explanation and it makes sense when the grammar is considered. I leave that for your consideration. I do not find the regular secular, scientific, and doubting argument about literal days to hold much theological ‘water’. It is designed to create doubt when the Hebrew grammar seems to solve the supposed problem. Sailmaher, John H 1990. Genesis, in Frank E Gaebelein (gen. ed. ), The Expositor’s Bible Commentary, vol. 2, pp. 1-284. This conclusion is based on science being the final arbiter over the Bible’s exegetical statements from Genesis 1. The alleged scientific, evolutionary conclusion is the decider. Human reason usurps the role of God’s revelation. It makes Scripture fit into the scientific framework, which is intolerable for biblical revelation. RayComfort #1, 9 September 2012. Christian Forums, Christian Apologetics, ‘On what day was the sun created’, available at: http://www.christianforums.com/t7686289/ (Accessed 10 September 2012). Much of the following response was given by me as OzSpen at ibid #16. Copyright © 2013 Spencer D. Gear. This document last updated at Date: 25 April 2018. This entry was posted in Evolution vs Creationism, Genesis on 10 September 2012 by spencer. Contrary to Col of Petrie’s comments (Press July 18) there are no facts being discovered that bring the theory of evolution into question. In fact, the reverse is true. Evolutionary theory is based on science not on belief. Every discovery, bit of evidence and experiment confirm the theory. Mainstream faiths accept this and don’t take the first book of the Bible literally. It is only fundamentalist fringe that seem incapable of accepting scientific fact and seem set on trying to impose their ignorance on the rest of us. This brief explanation of ‘theory’ states: ‘Theories are analytical tools for understanding, explaining, and making predictions about a given subject matter. There are theories in many and varied fields of study, including the arts and sciences’. When applied to evolution, this means that an evolutionary theory is a way of explaining and making predictions about Darwin’s and continuing explanations of evolution in science. Yes, there are theories that are developed, based on facts that have been uncovered. Natural selection explained how life evolved from the first simple organisms; how in nature the fittest win out, leaving more offspring with more of their desirable characteristics. This survival of the fittest would, over time, allow a species to change and develop until eventually new species could arise. Given billions of years, natural selection could create, unguided, the diversity of life on Earth. Evolutionary belief is a remarkable and largely unexplained phenomenon. It is a belief held by most intellectuals all over the world, despite the fact that there is no real scientific evidence for it at all. Evolutionists allege that evolution is a proved scientific fact, based on a multitude of scientific proofs, but they are unable to document even one of these supposed proofs! Morris cited David Kits who stated that ‘Evolution, at least in the sense that Darwin speaks of it, cannot be detected within the lifetime of a single observer’. What are the holes in the argument in Toyne’s letter to the editor? He confuses theory and fact. Evolution is a theory. Some could even say that there is insufficient evidence for it to be called a theory and that it is nothing more than an hypothesis. Facts may point to the need to develop a theory, but we must not confuse facts with a theory. A theory is a proposed explanation; it is not a statement of facts. If evolution is based on science and not belief, why does this ‘belief’ continue when the transition species are just as non-existent as they were when Darwin announced his theory 150 years’ ago? He gives this false statement, ‘Every discovery, bit of evidence and experiment confirm the theory’. What are the facts concerning transition species? We’ll briefly examine this below. ‘Mainstream faiths’ are not defined, but I expect he is referring to theological liberalism in mainline denominations. This is using the logical fallacy of ‘appeal to authority’. Rational discussion is handicapped when people resort to the use of logical fallacies. He uses a genetic logical fallacy by diverting attention to the ‘fundamentalist fringe’ and rejecting it because of its origin. He should be addressing the issue and not associating it with a group of which he apparently does not approve. If mainstream faiths do not read the book of Genesis literally, this is not an argument for whether literal or otherwise should be used. A short letter just gives opportunity for him to make assertions without defending his claims. Therefore, his views are open to challenge, as I’m doing briefly here. What are the facts about transition species? Why then is not every geological formation and every stratum full of such intermediate links? Geology assuredly does not reveal any such finely graduated organic chain; and this, perhaps, is the most obvious and gravest objection which can be urged against my theory. (Darwin 1902:413, ch 9 link; also in ch 10). I fully agree with your comments about the lack of direct illustration of evolutionary transitions in my book. If I knew of any, fossil or living, I would certainly have included them …. I will lay it on the line—there is not one such fossil for which one could make a watertight argument. The absence of fossil evidence for intermediary stages between major transitions in organic design, indeed our inability, even in our imagination, to construct functional intermediates in many cases, has been a persistent and nagging problem for gradualistic accounts of evolution (Gould in Smith 1982:140). “New species almost always appeared suddenly in the fossil record with no intermediate links to ancestors in older rocks of the same region” (1977:12). ‘The extreme rarity of transitional forms in the fossil record persists as the trade secret of paleontology. The evolutionary trees that adorn our textbooks have data only at the tips and nodes of their branches; the rest is inference, however reasonable, not the evidence of fossils’ (1977:14). ‘I regard the failure to find a clear ‘vector of progress’ in life’s history as the most puzzling fact of the fossil record’ (Gould 1984, link). Marcus Toyne (North Lakes Times, Aug 8) seems to have confused theory and fact with his statement that ‘there are no facts being discovered that bring the theory of evolution into question’. Evolution is a theory and its problem with finding transition species to agree with the theory is as bad now as in Darwin’s day, 1.5 centuries ago. There are major facts that question the evolutionary theory. Darwin said that every stratum of geological formation should be full of intermediate links. They weren’t there in Darwin’s day and are still not. Dr Colin Patterson, former palaeontologist of the British Museum of Natural History, wrote that ‘there is not one such fossil for which one could make a watertight argument’. Former leading evolutionist of Harvard Uni, the late Stephen Jay Gould, wrote that the absence of fossil evidence for intermediatry stages ‘has been a persistent and nagging problem for gradualistic accounts of evolution’. As for Toyne’s view that mainstream faiths ‘don’t take the first book of the Bible literally’, this is a red herring. ‘In the beginning God created the heavens and the earth’ and then statements of what was created on day 1, day 2, etc., are literal ways of stating God’s creation of our magnificent universe, according to Genesis 1. Was the newspaper so adventurous as to print this letter? At least the paper did print a significant part of the above letter for which I’m grateful. How much of this letter do you think that the North Lakes Times printed? Here is what appeared in the paper on August 15, 2012, page E10. Marcus Toyne (Pine Rivers Press, August 8) seems to have confused theory and fact when saying “there are no facts being discovered that bring the theory of evolution into question”. Evolution is a theory and its problem with finding transition species to agree with the theory is as bad now as in Darwin’s day, 150 years ago. Darwin said that every stratum of geological formation should be full of intermediate links. They weren’t there in Darwin’s day and are still not. Former leading evolutionist of Harvard University, the late Stephen Jay Gould, wrote the absence of fossil evidence for intermediary stages “has been a persistent and nagging problem for gradualistic accounts of evolution”. As for Toyne’s view that mainstream faiths “don’t take the first book of the Bible literally”, is a red herring. “In the beginning God created the heavens and the earth” and then statements of what was created on day one and so on are literal ways of stating God’s creation of the universe, according to Genesis 1. Theories provide the framework for understanding how we share a common ancestor with other apes through evolution. There are transition fossils that scientists find regularly but they don’t label them as such. The second version in Genesis 2 contradicts parts of chapter 1. Some do not consider the biblical creation story to be literal as a description of origins. Marcus Toyne (NLT, 29 Aug) takes me to task over evolution as a theory and how Genesis 2 “contradicts part of the first (chapter of Gen.)”. Contrary to Marcus, a scientific theory doesn’t explain facts. It explains scientific observations and must be open to be falsifiable. The theory of evolution deals with unique events of the origin of life, including intelligence. These events are unrepeatable and cannot be subjected to the same kind of experimental investigation of a regular scientific theory. He claimed scientists regularly find transition fossils but gave not one example. Not one! Dr Colin Patterson, senior paleontologist of the British Museum of Natural History, wrote in 1981 that evolution was “positively anti-knowledge” and that “all my life I had been duped into taking evolution as revealed truth” [in Taylor 1984:393]. Evolutionary biologist, Ernst Mayr, wrote that the basic theory of evolution “is in many instances hardly more than a postulate and its application raises numerous questions in almost every concrete case” [in Taylor 1984:393]. A postulate is a supposition that is assumed without proof. These scientific specialists are not as certain as Marcus. So Genesis 2 contradicts chapter 1? But Marcus gave zero examples. This makes his a red herring kind of argument. However, the JEPD theorists have proposed this for many years and it has been refuted over and over. Ch 2 does not present a complete creation story or the time sequence of ch 1. If anyone misses the nature of a key word in the first 5 words of Genesis 1, there will be misleading information promoted. Those words are, “In the beginning GOD created”. If one does not understand the omnipotent Yahweh God who created (Hebrew bara = out of nothing) the universe, the one who parted the Red Sea for the Israelites to pass over on dry land and drowned the pursuing Egyptians, and the God who raised Jesus Christ from the dead, then one will misunderstand the mighty acts of God in creating the universe. A theory is a collected theory of facts that explains observed phenomena. The theory of evolution by natural selection is fact that is explained by the scientific facts. The book of Genesis is a myth. How does Spencer explain the anomaly in Genesis 1 that green vegetation was created on day 3 and there was no sun until day 4. So “the book of Genesis is a myth”, says Phil Gilbank (NLT, Aug 29). That’s his assertion that reveals one of his presuppositions. He provided no evidence. The wayyiqtol narrative structure of the Genesis creation accounts shows that the author wanted the readers to understand the account as happening in history. There is evidence to show that Adam and Eve were real people. Genesis 1-2 presents them as actual human beings and it narrates the events of their lives as history. Have a guess what? They gave birth to literal children who produced similarly (Gen. 4:1, 25; 5:1ff). Later Old Testament genealogies placed Adam at the top of the list (see 1 Chronicles 1:1). In the New Testament, Adam is placed at the beginning of Jesus’ literal ancestors (Luke 3:38). Jesus Christ himself referred to Adam and Eve as the first literal “male and female” indicating that their physical union was the basis of marriage (Matthew 19:4). Phil thinks there is an anomaly between God creating vegetation on day 3 with no sun until day 4. Is Phil assuming days as representing millions of years? Whenever the Hebrew yom (day) is used with a numeral, it refers to a literal 24-hour period. Hebrew scholars, Keil & Delitzsch, stated that the days of creation, using the interchange of light and darkness, “must be regarded not as periods of time of incalculable duration, or years or thousands of years, but as simple earthly days” (n.d.:51). By the way, the sun is not the only source of light. Phil will continue to have an issue with God’s creation of the universe as long as he retains the false view of Genesis being myth (not an uncommon theory) and failure to understand the nature of the omnipotent Lord God Almighty who created the heavens and the earth. What is the meaning of ‘wayyiqtol narrative structure’ in the Hebrew language? ‘The most predominant verbal form in Biblical Hebrew narrative prose is WAYYIQTOL (41% of the total clauses in the texts and 79.2% of the total clauses in the narrative portion of the texts analyzed). The use of this form in uninterrupted syntactical chains consistently implies sequentiality of action in the narrative’ (Journal of Hebrew Scriptures, Vol 5, 2004-2005). Another put it this way: ‘Biblical Hebrew narrative usually employs verbal forms referring to the past, the variety of which is due not to an indication of tense, but rather aspect and narrative organization. Narrative sequence is mostly achieved by wayyiqtol clauses, which appear to be dominant in this genre, while boundaries of paragraphs and off-line information are usually achieved by non-wayyiqtol clauses’ (review of Roy L Heller 2004, Narrative Structure and Discourse Constellations, The Free Library). Darwin C R 1902, The Origin of Species by Means of Natural Selection (online), 6th ed. London: John Murray,available at: http://www.literature.org/authors/darwin-charles/the-origin-of-species-6th-edition/index.html (Accessed 8 August 2012). Gould, S J 1977. Evolution’s erratic pace, Natural History 86, May, 12-16. Gould, S J 1984. The Ediacaran experiment, Natural History 93(2):14–23, February. available at: http://www.sjgarchive.org/library/text/b16/p0298.htm (Accessed 8 August 2012). Keil, C F & Delitzsch, F n.d. Commentary on the Old Testament: The Pentateuch, vol 1. Grand Rapids, Michigan: William B. Eerdmans Publishing Company. Smith, J S (ed) 1982. Evolution now: a century after Darwin. New York: Macmillan Publishing Co.
Taylor, I T 1984. In the minds of men: Darwin and the new world order. Toronto: TFE Publishing. I am indebted to this author for some of the following citations: Johathan Safarti’s article, ‘Refuting evolution’, Creation Ministries International, available at: http://creation.com/refuting-evolution-chapter-3-the-links-are-missing (Accessed 8 August 2012). C. Patterson, letter to Luther D. Sunderland, 10 April 1979, as published in Darwin’s Enigma (Green Forest, AR: Master Books, 4th ed. 1988), p. 89. The email was sent to: letters@northlakestimes.com.au. This entry was posted in Evolution vs Creationism, Genesis on 8 August 2012 by spencer. Is Richard Dawkins an agnostic or an atheist? Could Dawkins disprove the existence of God? He could not, he confessed, describing himself not as an atheist but as an agnostic – to gasps from Twitter, where the unlikely #dawkinsarchbishop hashtag was trending. On his own atheism scale of one-to-seven, the Professor suggested, “the probability of any supernatural creator existing is very, very low, so let’s say I’m a 6.9″…. “I am baffled,” responded Dawkins, “by the way sophisticated theologians who know Adam and Eve never existed still keep talking about it.” God, he said, “cluttered up” his scientific worldview. “I don’t see clutter coming into it,” Williams replied. “I’m not thinking of God as an extra who has to be shoehorned into it” (Walker 2012). Here is a clip from the debate on YouTube, where Dawkins admits he is an agnostic and not an atheist: See HERE. Professor Richard Dawkins today dismissed his hard-earned reputation as a militant atheist – admitting that he is actually agnostic as he can’t prove God doesn’t exist. The country’s foremost champion of the Darwinist evolution, who wrote The God Delusion, stunned audience members when he made the confession during a lively debate on the origins of the universe with the Archbishop of Canterbury…. But when Archbishop Dr Rowan Williams suggested that Professor Darwin is often described as the world’s most famous atheist, the geneticist responded: ‘Not by me’. Professor Dawkins went on to say what he believed was a ‘6.9’, stating: ‘That doesn’t mean I’m absolutely confident, that I absolutely know, because I don’t’…. This latest admission by Professor Dawkins comes after he was left lost for words [to] name the full title of his scientific hero’s most famous work during a radio discussion last week in which he accused Christians of being ignorant of the Bible. In his frustration, he resorted to a helpless: ‘Oh God’ (Hills 2012). However, this is not a new perspective from Dawkins. As we shall see, this is a similar view to what he has already promoted in The God delusion (2006). Professor Dawkins has ALWAYS said he is an agnostic atheist, which is distinct from a simple agnostic. The Mail is engaging in sensationalism, yet again. (Joseph Martin, Fort Collins, Colorado, USA, 26/2/2012) [Walker 2012]. This is a U-turn in his rhetoric. Remember Dawkins wrote a chapter in The God Delusion called “The Poverty of Agnosticism”? Is he now impoverished?? (Juan, Slough, UK, 26/2/2012). Comparing religion with science is misrepresenting science. Science is simply the logical application of thought to problems – processing what you currently know to explain things better. It isn’t an alternative belief system, it is a way of teasing out truth from ideas. One truth we have discovered is that lots of things are unprovable. I cannot prove my desk exists but we accept this as a proven ‘fact’. Arguing otherwise is just untenable. We have worked out that the earth is billions of years old. If Jesus is the son of God, the Bible wouldn’t describe the earth as a few thousand years old and there wouldn’t be so many other factual errors. Common sense tells you that, if the writers didn’t know any more than the smart guys of the day, there is no need to look for a supernatural explanation. We may not be able to prove God doesn’t exist, but we *have* proved the Bible to be wrong on many fundamental points (even theologians agree). Belief based on the Bible is untenable (Dave, Cambridge, UK, 26/2/2012) [Walker 2012]. This is interesting, particularly in light of his past identification as an atheist, as well as his remarks that on a scale of 1 to 7, with one being “I know God exists” and seven being “I know God doesn’t exist,” he ranks himself a 6.9. He is only 0.1 away from being absolutely certain God does not exist, and yet he thinks that is good reason to adopt the agnostic label. I disagree. The presumption here is that to be an atheist one must be 100% sure that God does not exist, and if one is not 100% sure then they are agnostic (Christians often make this same mistake in reasoning). But since when has atheism described the level of certainty one has regarding the non-existence of God? Atheism describes the position of those who think the proposition “God exists” is false, regardless of their level of confidence that this is so. Whether they are 99% or 51% sure the proposition is false, it is the mere fact that they think it is false that makes them an atheist…. If one must be 100% certain that God does not exist before it is appropriate to designate one’s position as “atheism,” then I think most philosophers would agree that no one could be an atheist. the view that I shall defend is very different: agnosticism about the existence of God belongs firmly in the temporary or TAP [Temporary Agnosticism in Practice] category. Either he exists or he doesn’t. It is a scientific question: one day we may know the answer, and meanwhile we can say something very strong about the probability…. God’s existence or non-existence is a scientific fact about the universe, discoverable in principle if not in practice. If he existed and chose to reveal it, God himself could clinch the argument, noisily and unequivocally, in his favour (Dawkins 2006:70, 73, emphasis added). However, he did write that he was agnostic about the existence of God ‘only to the extent that I am agnostic about fairies at the bottom of the garden’ (Dawkins 2006:74). So Dawkins, even in The God delusion (2006), was admitting his temporary agnostic position that, by definition, will lead to full-blown atheism one day when the scientific evidence is eventually found to deny the existence of God. (1) ‘It is impossible to overstress the difference between such a passionate commitment to biblical fundamentals and the true scientist’s equally passionate commitment to evidence’ (2006:19). (2) ‘Dyed-in-the-wool faith-heads are immune to argument, their resistance built up over years of childhood indoctrination using methods that took centuries to mature (whether by evolution or design) [2006:28]. (3) ‘The whole point of religious faith, its strength and chief glory, is that it does not depend on rational justification. The rest of us are expected to defend our prejudices. But ask a religious person to justify their faith and you infringe “religious liberty”’ (2006:45, emphasis added). (4) ‘Not surprisingly, since it is founded on local traditions of private revelation rather than evidence, the God Hypothesis comes in many versions’ (2000:52). (5) ‘There is nothing wrong with being agnostic in cases where we lack evidence one way or the other. It is the reasonable position’ (2000:69). (6) ‘If he existed and chose to reveal it, God himself could clinch the argument, noisily and unequivocally, in his favour’ (2006:73, emphasis added). (7) ‘I shall not consider the Bible further as evidence of any kind of deity’ (2006:122-123). (8) ‘It would be interesting to know whether there was any statistical tendency, however slight, for religious believers to loot and destroy than unbelievers. My uninformed prediction would have been opposite’ (2006:261). (9) ‘Adherents of scriptural authority show distressingly little curiosity about the (normally highly dubious) historical origins of their holy books’ (2006:267). (10) ‘Much of the Bible is not systematically evil but just plain weird, as you would expect of a chaotically cobbled-together anthology of disjointed documents, composed, revised, translated, distorted and “improved” by hundreds of anonymous authors, editors and copyists, unknown to us and mostly unknown to each other, spanning nine centuries’ (2006:268). (11) ‘Let’s charitably put it down again to the ubiquitous weirdness of the Bible’ (2006:273). (13) ‘when you have been taught that truth comes from scripture rather than from evidence’ (2006:379). A scientific process or scientific method requires observations of nature and formulating and testing the hypothesis. It consists of following four steps. 5. Create your conclusion on the basis of data or information gathered in your experiment. Observation – a perception, viewing of phenomena. 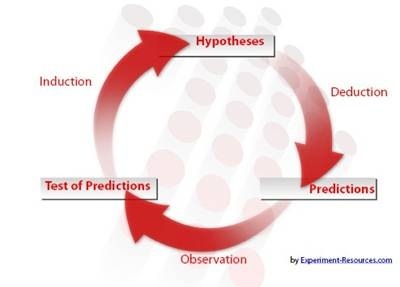 Hypothesis – a proposed explanation is developed to account what has been observed. Experimentation – tests are developed to validate or invalidate the hypothesis. Prediction – after tests and validation of the hypothesis, predictions are made based upon the evidence gathered in experimentation. Theory – a theory is based upon a hypothesis, verified by testing, and is generally accepted as being an accurate explanation of phenomena. What should be emphasised more in this overview is that the scientific method deals with in the measurable, the observable and the repeatable. Therefore, it is used primarily with experiments in the present time that can be observed, have hypotheses created, data accumulated to confirm or disconfirm the predictions of the hypothesis, and further hypotheses proposed to be tested for verification or falsification. I do not consider that ultimate questions can be decided through use of the scientific method in its strictest sense. In my view, the existence of God and their being reason and purpose in the universe, cannot be analysed according to the scientific method’s use of observing things in the present time and testing them. Science is the only reliable tool that we possess to understand out world. It has no limits. We may not know something now—but we will in the future. It is just a matter of time. This view, found throughout Dawkins’s body of writings, is given added emphasis in The God Delusion, which offers a vigorous defense of the universal scope and conceptual elegance of the natural sciences…. The point is simple: there are no “gaps” in which God can hide. Science will explain everything—including why some still believe in such a ridiculous idea as God. Yet it is an approach that simply cannot be sustained…. Dawkins does, I have to say with regret, tend to portray anyone raising questions about the scope of sciences as a science-hating idiot (McGrath & McGrath 2007:35-36). ‘The God Delusion is a work of theatre rather than scholarship…. Many have been disturbed by Dawkins’s crude stereotypes, vastly oversimplified binary oppositions (science is good; religion is bad), straw men and hostility toward religion. Might The God Delusion actually backfire and end up persuading people that atheism is just as intolerant, doctrinaire and disagreeable as the worst that religion can offer?… Yet the fact that Dawkins relies so excessively on rhetoric rather than the evidence that would otherwise be his natural stock in trade clearly indicates that something is wrong with his case…. Might atheism be a delusion about God? (McGrath & McGrath 2007:96-97, emphasis in original). Let’s get back to Dawkins challenging statement about God: ‘If he existed and chose to reveal it, God himself could clinch the argument, noisily and unequivocally, in his favour’ (2006:73). So Dawkins is the master of evidence on the existence of God and he challenges God to ‘clinch the argument’, not in just some robust fashion, but God could do it ‘noisily and unequivocally’ and this would be in God’s favour – if only God would take Dawkins’ advice and do it as Dawkins wants. D. Wait a minute, Richard Dawkins! ‘The heavens declare the glory of God; the skies proclaim the work of his hands’ (Psalm 19:1 NIV). ‘Since what may be known about God is plain to them [godless, wicked people], because God has made it plain to them. For since the creation of the world God’s invisible qualities—his eternal power and divine nature—have been clearly seen, being understood from what has been made, so that people are without excuse’ (Romans 1:19-20 NIV, emphasis added). They [Gentiles, non-Jews] show that the requirements of the law are written on their hearts, their consciences also bearing witness, and their thoughts sometimes accusing them and at other times even defending them. (Romans 2:15 NIV). Jesus said, ‘Anyone who has seen me has seen the Father’ (John 14:9 NIV). He has revealed Himself through natural revelation – in the heavens, through what has been made in the natural world. A person’s heart/conscience has the law of God on it. If you’ve had knowledge of Jesus through the proclamation of the Gospel and through access to the Scriptures, you have seen God, the Father, in action. You know of God’s invisible attributes and you know some of what he does. To be a 99.9% atheist is not acceptable before the holy and just God who ‘does not show favoritism’ (Romans 2:11). Therefore, Richard Dawkins and all of the ungodly people in the world, you are without excuse. Not one person who has ever existed will be able to stand before God on judgment day and say, ‘You did not reveal yourself to me, God, to clinch the argument, noisily and unequivocally, in your favour’. E. What are Richard Dawkins and all unbelievers up to? Imagine someone holding forth on biology whose only knowledge of the subject is the Book of British Birds, and you have a rough idea of what it feels like to read Richard Dawkins on theology. Card-carrying rationalists like Dawkins, who is the nearest thing to a professional atheist we have had since Bertrand Russell, are in one sense the least well-equipped to understand what they castigate, since they don’t believe there is anything there to be understood, or at least anything worth understanding. This is why they invariably come up with vulgar caricatures of religious faith that would make a first-year theology student wince. The more they detest religion, the more ill-informed their criticisms of it tend to be (Eagleton 2006). Eagleton describes Dawkins as being ‘theologically illiterate’ and Dawkins has provided ‘vulgar caricatures of religious faith’ (Eagleton 2006). Well said, Terry, and your entire review is a scintillating assessment of Richard Dawkins’ ineptitude when it comes to theology. F. How reliable is the Bible? ‘To be fair, much of the Bible is not systematically evil but just plain weird’ (2006:268). ‘Despite the good intentions of the sophisticated theologian, a frighteningly large number of people still do take their scriptures, including the story of Noah, literally. According to Gallup, they include approximately 50 per cent of the US electorate’ (2006:269). ‘Scientists may think it is nonsense to teach astrology and the literal truth of the Bible’ (2006:367). ‘Jesus was not content to derive his ethics from the scriptures of his upbringing. He explicitly departed from them, for example when he deflated the dire warnings about breaking the sabbath. “The sabbath was made for man, not man for the sabbath” has been generalized into a wise proverb’ (2006:284). ‘There are other teachings in the New Testament that no good person should support. I refer especially to the central doctrine of Christianity: that of “atonement” for “original sin”. This teaching, which lies at the heart of New Testament theology, is almost as morally obnoxious as the story of Abraham setting out to barbecue Isaac, which it resembles’ (2006:284). ‘What kind of ethical philosophy is it that condemns every child, even before it is born, to inherit the sin of a remote ancestor?’ (2006:285). ‘The Christian focus is overwhelmingly on sin sin sin sin sin sin sin. What a nasty little preoccupation to have dominating your life’ (2006:285). ‘I have described atonement, the central doctrine of Christianity, as vicious, sadomasochistic and repellent. We should also dismiss it as barking mad, but for its ubiquitous familiarity which has dulled our objectivity. If God wanted to forgive our sins, why not just forgive them, without having himself tortured and executed in payment?’ (2006:287). ‘Adam, the supposed perpetrator of the original sin, never existed in the first place: an awkward fact -excusably unknown to Paul but presumably known to an omniscient God (and Jesus, if you believe he was God?) – which fundamentally undermines the premise of the whole tortuously nasty theory [of the atonement] (Dawkins 2006:287). ‘The God of the Old Testament is arguably the most unpleasant character in all fiction: jealous and proud of it; a petty, unjust, unforgiving control-freak; a vindictive, bloodthirsty ethnic cleanser; a misogynistic, homophobic, racist, infanticidal, genocidal, filicidal, pestilential, megalomaniacal, sadomasochistic, capriciously malevolent bully. Those of us schooled from infancy in his ways can become desensitized to their horror’ (2006:51). ‘For a more sophisticated believer in some kind of supernatural intelligence, it is childishly easy to overcome the problem of evil. Simply postulate a nasty god – such as the one who stalks every page of the Old Testament’ (2006:135). ‘Begin in Genesis with the well-loved story of Noah, derived from the Babylonian myth of Uta-Napisthim and known from the older mythologies of several cultures. The legend of the animals going into the ark two by two is charming, but the moral of the story of Noah is appalling. God took a dim view of humans, so he (with the exception of one family) drowned the lot of them including children and also, for good measure, the rest of the (presumably blameless) animals as well’ (2006:269). ‘Look it up in Judges 19:29. Let’s charitably put it down to the ubiquitous weirdness of the Bible’ (2006:273). ‘Yet the legend [of Abraham] is one of the great foundational myths of all three monotheistic religions’ (2006:275). ‘Modern morality, wherever else it comes from, does not come from the Bible’ (2006:279). ‘And the Bible story of Joshua’s destruction of Jericho, and the invasion of the Promised Land in general, is morally indistinguishable from Hitler’s invasion of Poland, or Saddam Hussein’s massacres of the Kurds and the Marsh Arabs. The Bible may be an arresting and poetic work of fiction, but it is not the sort of book you should give your children to form their morals’ (2006:280). Those assaults by Richard Dawkins should stir you to realise that there is a tirade of antagonism, not only from Dawkins, but also from others. That should give you enough ammunition to indicate that there are people in university land who have a deep hostility towards the Bible and the God of the Bible. In being an apologist for the Christian faith in the twenty-first century, you’ll need to defend the reliability of the Scriptures. I refer you to my four articles that deal with this matter in an introductory way. For further reading on the reliability of the Bible, I recommend: Blomberg (2007); Bruce (1960); Kaiser Jr (2001); Kitchen (2003); Montgomery (1984); Montgomery (1986). ‘God shows his anger from heaven against all sinful, wicked people who suppress the truth by their wickedness’ (Rom 1:18 NLT, emphasis added). Suppression of the truth of God’s evidence in creation, conscience and through Jesus, is what is being done by Dawkins and everyone else who rejects the evidence for God’s existence. However, God needs more than release from the suppression of the truth, to effect reconciliation with God Himself. This is God’s requirement: “Repent and believe the good news [the Gospel]” (Mark 1:15). Jesus said to his disciple, Thomas, ‘Then Jesus told him, “Because you have seen me, you have believed; blessed are those who have not seen and yet have believed”’ (John 20:29). I pray that Richard Dawkins and all ungodly people will have their eyes opened to the evidence that is unequivocally before them and they will repent of their sins and believe in Christ for salvation (eternal life). As long as they have breath, they have the opportunity to respond in faith to Christ. Blomberg, C L 1987. The historical reliability of the gospels. Leicester: Inter-Varsity Press. Bruce, F F 1960. The New Testament documents: Are they reliable? rev ed. Leicester: Inter-Varsity Press. Dawkins, R 2006. The God delusion. London: Black Swan (a division of Transworld Publishers). Eagleton, T 2006. Lunging, Flailing, Mispunching (a review of Richard Dawkins’ The God delusion) [online], 19 October. London Review of Books, vol 28, no 20. available at: http://www.lrb.co.uk/v28/n20/terry-eagleton/lunging-flailing-mispunching (Accessed 23 March 2012). Hills, S 2012. ‘I can’t be sure God DOES NOT exist’: World’s most notorious atheist Richard Dawkins admits he is in fact agnostic. Mail Online, February 24. Available at: http://www.dailymail.co.uk/news/article-2105834/Career-atheist-Richard-Dawkins-admits-fact-agnostic.html (Accessed 20 March 2012). Kaiser Jr., Walter C 2001. The Old Testament documents: Are they reliable & relevant? Downers Grove, Illinois / Leicester, England: InterVarsity Press. McGrath, A & McGrath, J C 2007. The Dawkins delusion. Downers Grove, Illinois: IVP Books. Montgomery, J W 1984. The testimony of the evangelists, examined by the rules of evidence administered in courts of justice. Grand Rapids, Michigan: Baker Book House. Montgomery, J W 1986. Human rights and human dignity. Grand Rapids, Michigan: Zondervan Publishing House. Walker, T 2012. Science vs God: Richard Dawkins takes on Archbishop of Canterbury. The Independent (online), February 24. Available at: http://www.independent.co.uk/news/science/science-vs-god-richard-dawkins-takes-on-archbishop-of-canterbury-7440051.html (Accessed 20 March 2012). An atheist is ‘a person who denies or disbelieves the existence of a supreme being or beings’ (dictionary.com), available at: http://dictionary.reference.com/browse/atheist?s=t (Accessed 26 March 2012). An agnostic is ‘a person who holds that the existence of the ultimate cause, as God, and the essential nature of things are unknown and unknowable, or that human knowledge is limited to experience’ (dictionary.com), available at: http://dictionary.reference.com/browse/agnostic?s=t (Accessed 26 March 2012). This was Charles Darwin and the full title of On the Origin of the Species was, On the Origin of Species by Means of Natural Selection, or the Preservation of Favoured Races in the Struggle for Life. The correct spelling is ‘Rowan’. The article was written on 2 March 2012. Available at: http://theosophical.wordpress.com/2012/03/02/dawkins-is-an-agnostic-why-certainty-is-irrelevant-to-defining-atheism/ (Accessed 20 March 2012). Scientific observation. Experiment-Resources.com, available at: http://www.experiment-resources.com/scientific-observation.html (Accessed 25 March 2012). Copyright © 2012 Spencer D. Gear. This document last updated at Date: 24 July 2016. This entry was posted in Agnosticism, Atheism, Science on 26 March 2012 by spencer. It’s an interview of a basic Aussie geologist and creationist, John Mackay, by Richard Dawkins, PhD scientist at Oxford University. My estimate was that Mackay found gaping holes in Dawkins worldview. This down home geologist who knows science, the Scriptures and his God, exposed the superficiality of Dawkins’ worldview. Dawkins tried to make this creationist who believes in a young earth, look like a fool before Dawkins who believes in a universe that is aged millions of years. I do not have the chutzpah to refuse on the grounds offered by one of my most distinguished scientific colleagues, whenever a creationist tries to stage a formal debate (I shall not name him, but his words should be read in an Australian accent): “That would look great on your CV; not so good on mine”. He has ‘a spellbound delight in the wonders of the natural world, and a passionate conviction that such wonders deserve nothing less than a purely natural explanation’. Creationists distort ‘the theory of punctuated equilibrium so that it appeared to support their preposterous (but astonishingly common) belief that there are no intermediates in the fossil record’. He does not accept the creationist admission that there are no transitional forms in the fossil record. Creationists need the publicity; evolutionists don’t. He encouraged other scientists not to debate creationists for the same reason. Here he stated: ‘I hope that my recollection of Stephen Gould’s wise words will encourage others to refuse all debating invitations from pseudoscientists avid for publicity’. However, on Bible-bube.com, in an informal debate, with crowds gathering in a public auditorium in the background to hear John Mackay, Richard Dawkins is debating a creationist geologist with an Australian accent – informally – and not in a public debate. After watching this video, I can assess another reason why Richard Dawkins would not want to enter into a formal debate with this Aussie geologist and creationist. John Mackay would expose the holes in Dawkins data and worldview and for a PhD scientist that would not look good on his resume. There is another person Richard Dawkins refuses to debate. See Richard Dawkins article in The Guardian [UK], “Why I refuse to debate with William Lane Craig: This Christian ‘philosopher’ is an apologist for genocide. I would rather leave an empty chair than share a platform with him” (20 October 2011). Dawkins, Richard 2006. The God delusion. London: Black Swan (a division of Transworld Publishers). This entry was posted in Evolution vs Creationism, Science on 18 March 2012 by spencer.